ALBAY, PHILIPPINES - this image taken by Ciriaco Santiago III on Wednesday, January 17, 2018 was on viral because of the stunning ash cloud shaped like the Bicolanos legend, Magayon. The shot was taken "accidentally" from a vantage point in Barangay Tagaytay, Camalig, Albay. While some netizens said the clouds looked like Mary supporting Jesus Christ, others commented that it reminded them of Mayon’s creation myth, which tells of the tragic end of a woman named Magayon (beautiful) who ran away with her warrior-lover to escape an unwanted suitor. A digitally manipulated image (top) showing the similarity of a photo taken by Ciriaco Santiago III to an illustration by Kerby Rosanes. 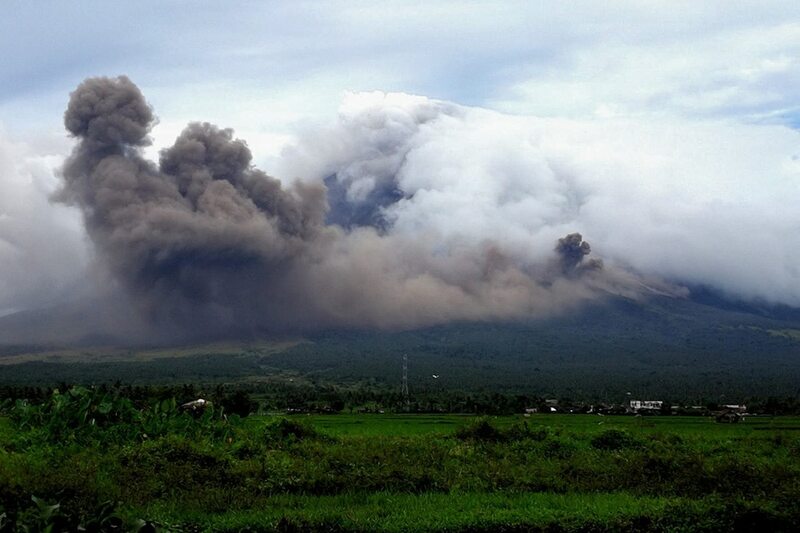 Contrary to the romantic and religious notions of others, some social media users said the clouds merely signify that Bicolanos near the volcano should immediately evacuate the area due to the formation’s massive size. Despite conflicting views, however, discussions came to a head when some Facebook users posted a manipulated image showing the similarity of Santiago’s shot to an illustration of Magayon and her lover, by artist Kerby Rosanes.